Good morning, all! 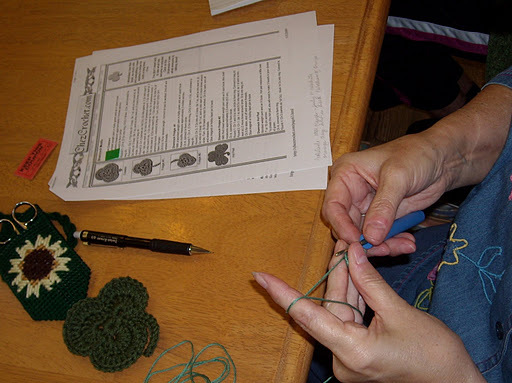 Yesterday was the second session of our charity project for 2009. 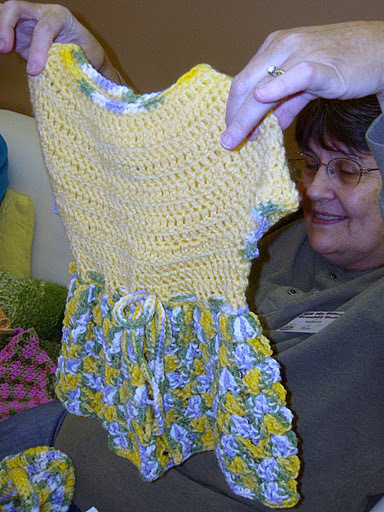 As you know, our project this year is teaching crochet to residents of Wichita Children’s Home. We were assigned to the older teen girls in the Independent Living section of the home. 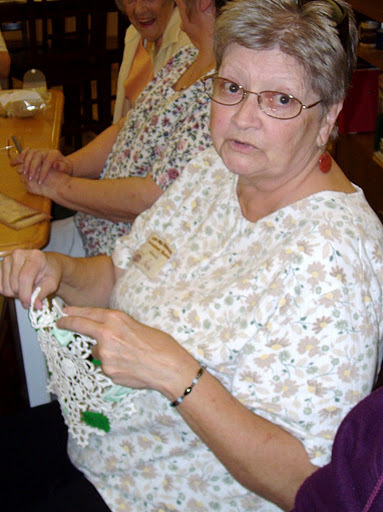 These young women are learning to live independently in the community. 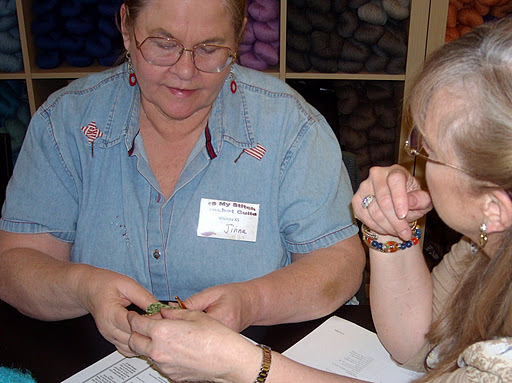 Kelly, Mary, Sharon, Tamara and I (Rosina) took our yarn and hooks and eagerly headed out yesterday for the opportunity to help others learn the craft we all love so much. I was unable to participate in February, so did not know what to expect. I was so glad that we were greeted warmly and enthusiastically by the girls. 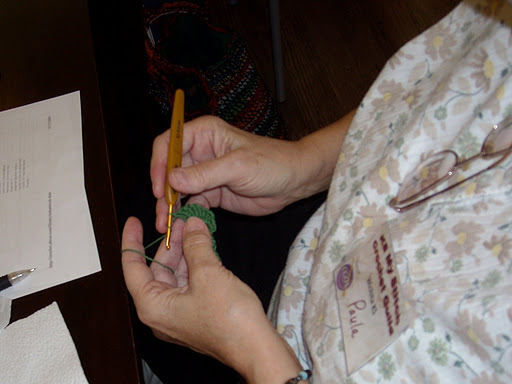 Some had prior experience with crochet and just needed to be shown things like how to turn, how to finish off, etc. 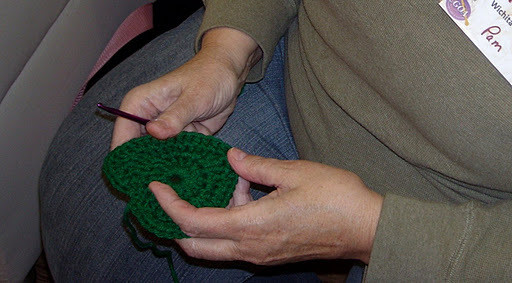 Others were new to crochet, but all were polite and seemed happy to have us there. Tamara was challenged by teaching a “leftie,” but her student bravely persevered and worked until the end — and she is getting it, slowly but surely. One young man in the Independent Living program even made tea and served it to us on a tray with china cups and saucers! How special is that?? As we were packing up to leave after over 1½ hours of teaching, chatting and laughing, they wanted to know how soon we were coming back. They seemed genuinely disappointed to hear we were only scheduled for once a month. And we had attracted several pleasant young men (whom I suspect were not there for the lesson), and a few staff members. I have never touted my teaching skills (or lack thereof), and had no idea if I would even be useful in this situation, but it was a very worthwhile afternoon for me. I am looking forward to being there again next month; I honestly believe these girls are giving to us every bit as much as we are giving to them! Understandably, we are not allowed to take pictures or I would flood this article with photos of us and these lovely young people. If this is something in which you would like to participate, please take note of the announcement at April’s meeting for times and dates. It was a very rewarding experience!! It’s that time of the month again. My report on the March meeting. Well, we started off with the usual short business meeting. 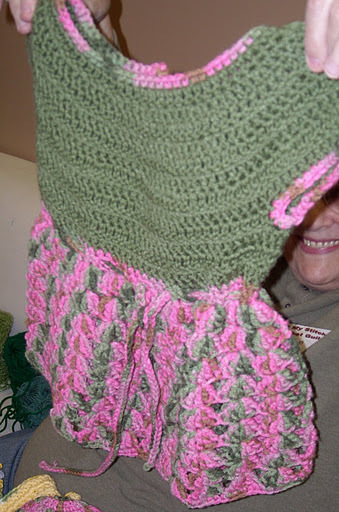 Announcing that it is National Crochet Month and to let everyone know that the guild was again allowed to use Twist windows to display some of our artwork. I also mentioned that the Wichita Eagle (daily newspaper) posted an article about KS (Kiss) My Stitch. We had 4 guests in the morning meeting and 6 in the evening. I think this was our largest groups so far. I talked about the charity classes on Saturday. We would be teaching the girls in the Independent Living group. This is where the Wichita Children’s Home teaches the girls life skills and how to live on their own. New business was next month’s program will be crocheted flowers and we also had some pretty colorful bookmarks advertising KS My Stitch with all of the pertinent information on them. We encouraged members to pick some up so that when they were talking about the guild they would have something to hand to people that had never heard of our guild. Announcements were: We are going to Hutchinson on a field trip on Saturday, April 18. We are asking that each person pay $5 to split between the drivers for gas, then you will need to bring spending and lunch money. I had a sign up sheet available, so far we have 13 people signed up. It should be lots of fun. 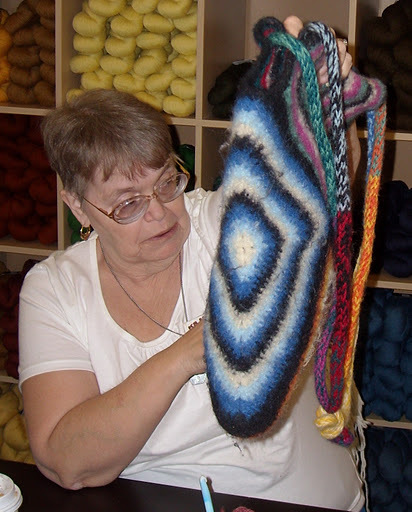 We will visit 2 yarn shops and a bead shop. There are also lots of antique stores if anyone is interested. And of course we will be eating lunch at a little Cafe on Main Street. I always ask if there is a tip of the month and this month was no exception. Except I was the only one that had a tip. I learned a little lesson in gauge. 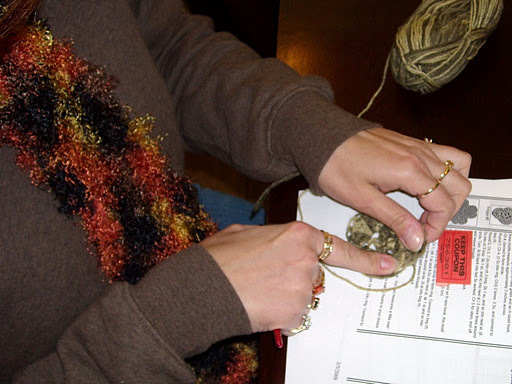 I have to confess that I don’t always make a gauge, unless I am making a garment. 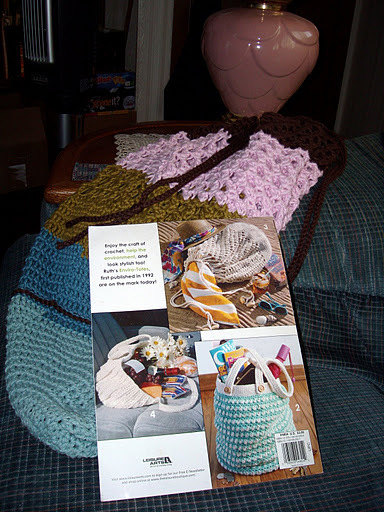 Well I decided to make the Lace Tote from a Leisure Arts Book called “Enviro-Totes”. This time I checked my gauge which was (Rnds 1-4 = 3 1/2″). 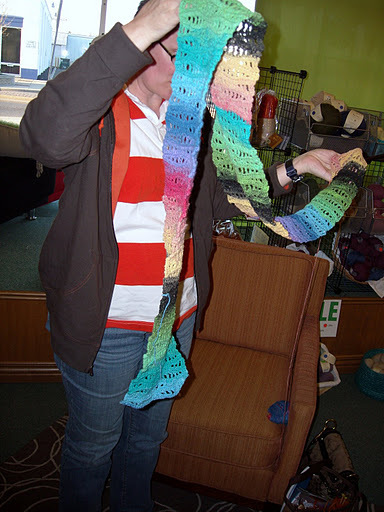 I measured 1-4 rows and thought oh well it is only 2″ no big deal, it will just be smaller. Well people the way you measure gauge for rounds is different than measuring rows. For rounds you measure across and through the center to the other side to round 4. I found that out from a friend of mine that hangs out at Twist on Thursday nights. My bag is twice the size that it is supposed to be and ended up to be a GIANT bag. But, I love it anyway. 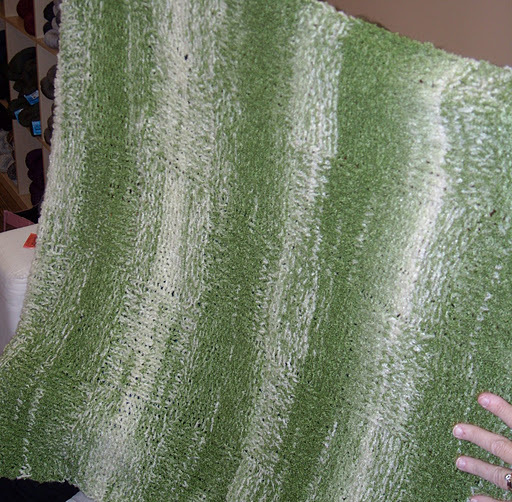 The picture doesn’t show how really big it is, but I can fit a twin size afghan in it. 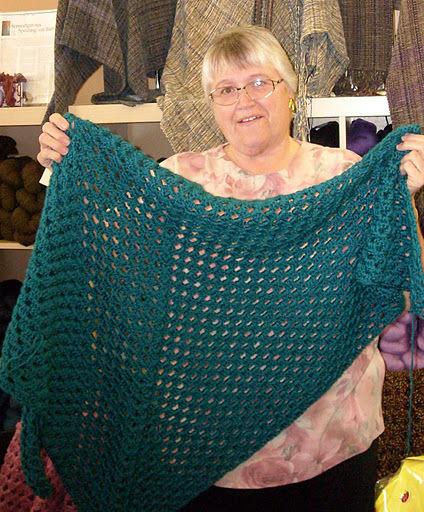 Paula brought her daughter Susan’s afghan to show everyone. Susan made it for her son. Very nice Susan. Kay didn’t bring anything to show but we were so glad to have her back. 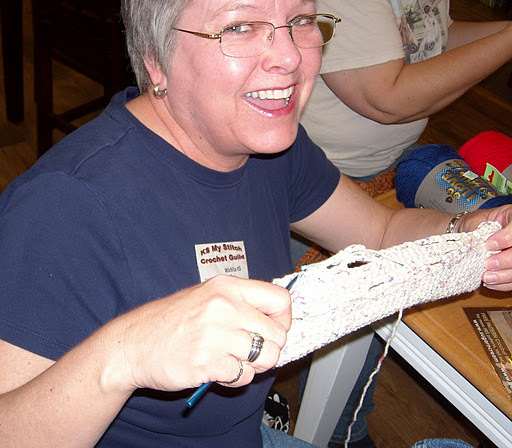 Linda G. is working on a scarf made off of Cori’s pattern. Very nice job Linda. 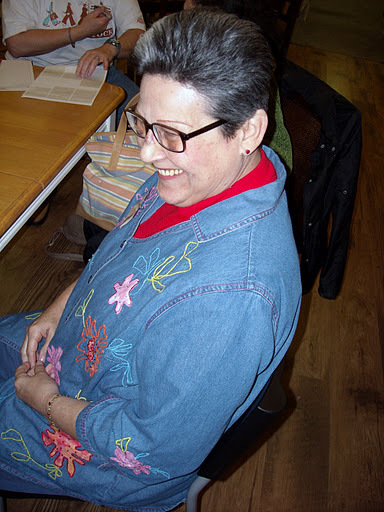 Donna was one of our guests. 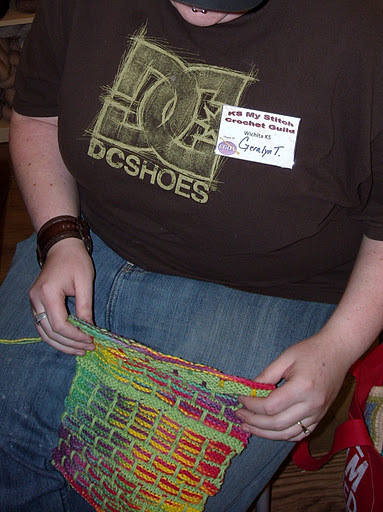 She confessed to me that she had been a KS My Stitch blog stalker for a while and had wanted to join us some time. She found out she could join us in the morning since she is a teacher and the guild meeting landed on a day during spring break. Donna also learned a lesson in gauge. 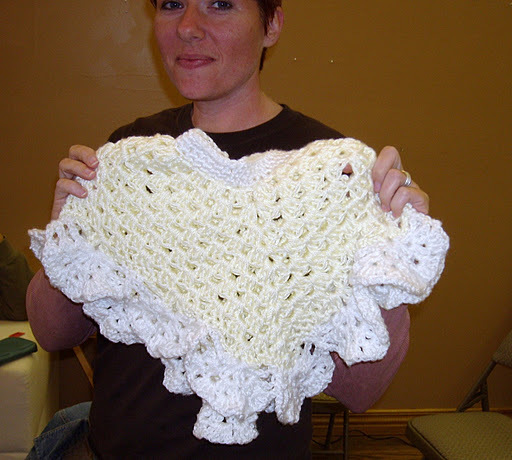 She made this poncho for a 3 year old and she said she would be lucky if it fit on an infants head. Good try Donna. 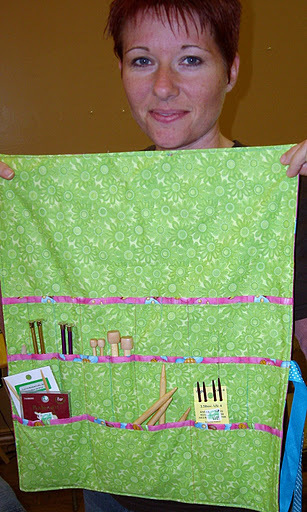 Donna went on a quilt retreat a couple of weekends ago with her mother’s (Lisa Johnson) quilt shop (Picket Fence Quilt Company)and made a case to hold her knitting needles (even her circular ones). Great job Donna! We are so glad you could join us! Sharon made a cute camera case. 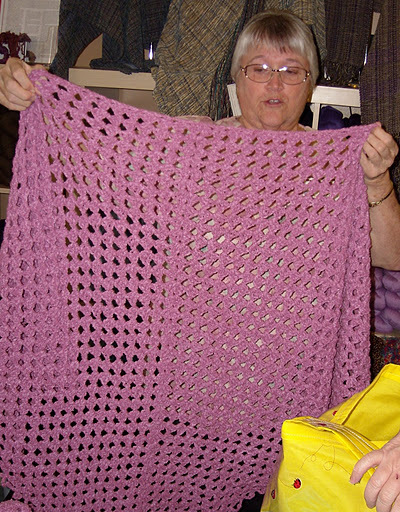 This is Sharon’s knitted afghan. Susie got the news that she is going to be a Grandma again, this time it is going to be a girl. 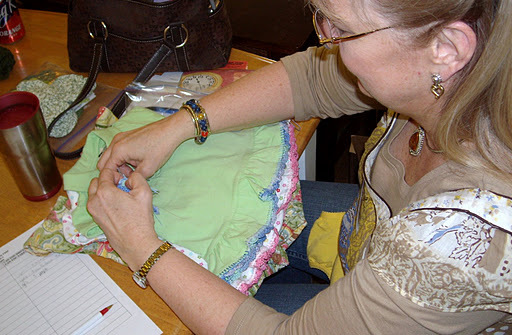 She got the embellishing bug and added some edging and flowers to some little dresses. Great Job Susie. 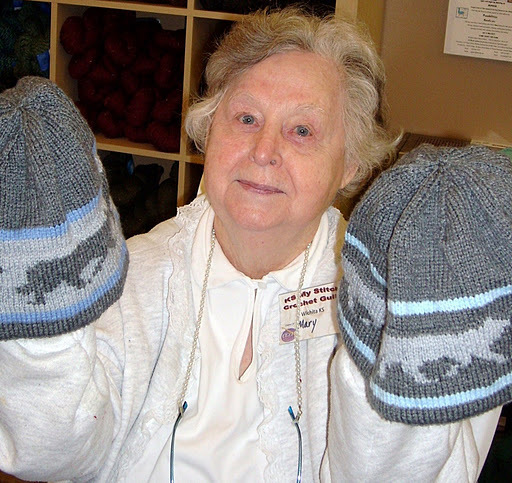 Mary was knitting hats that have wolves on them to donate to a charity auction. Mary is quite the charity queen. 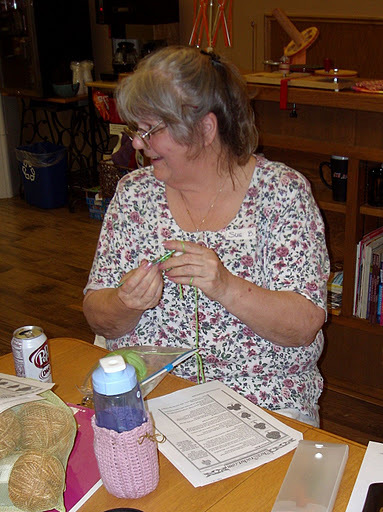 Jinna was able to join us again and she has been very busy trying to use all of her stash of yarn. 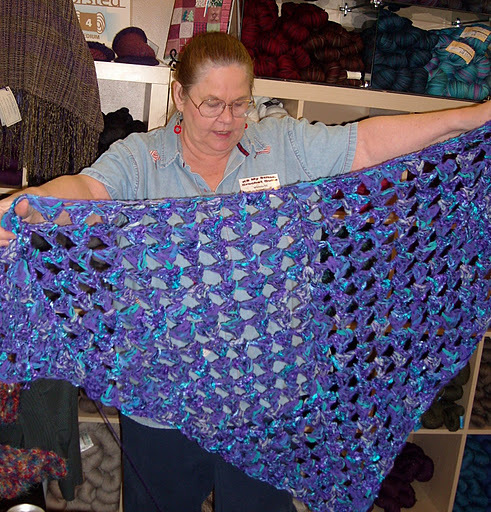 Beautiful shawl Jinna. 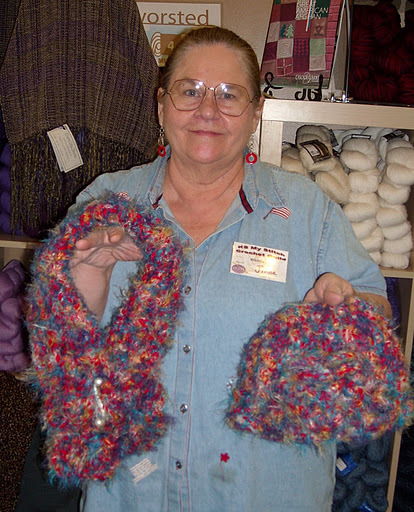 Jinna and her hat and muffler. 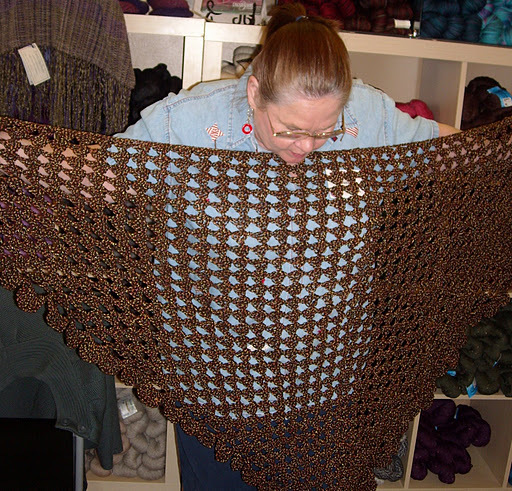 Another shawl made by Jinna. Pat is into bags this month. 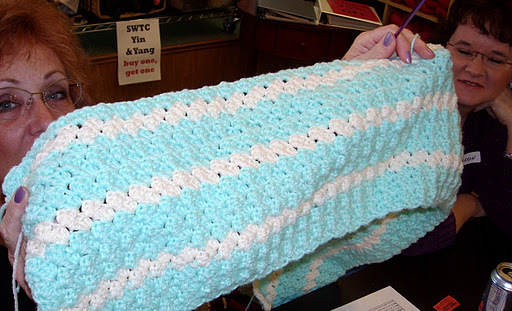 Linda C. brought her daughter Sharon and this is the baby afghan that Sharon is working on. So glad you could join us Sharon. 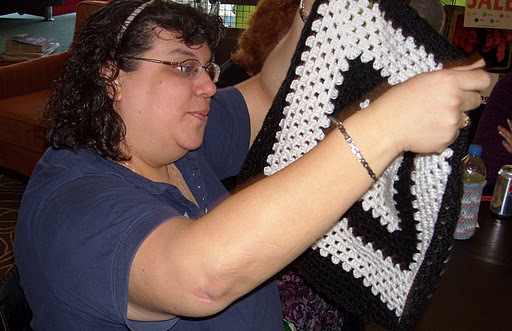 Cheryl is making a very large granny square afghan. 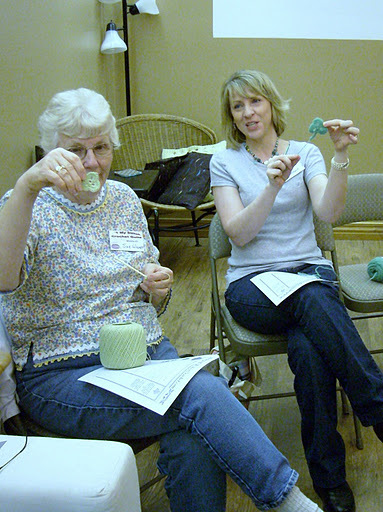 Sharon was one of our guest too (no it’s not the same Sharon, it was very funny we had 3 Sharons), anyway she brought her washcloth bath puff. Very cool! 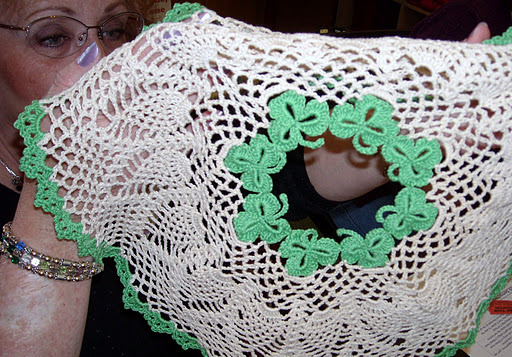 Paula brought one of her green leaf irish crochet doilies to show us. 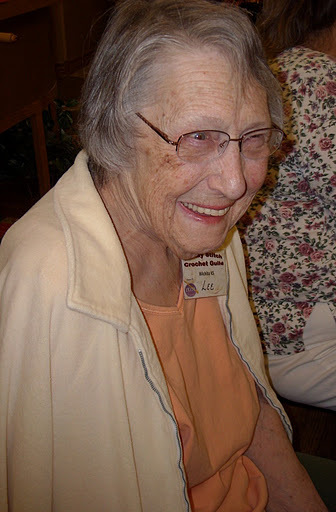 It was very nice to see Lee again and that she recovered from her hospital stay. She also brought a friend. 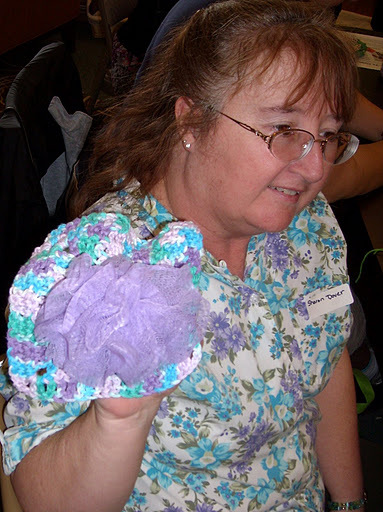 Stephanie embellished a cute little quilted heart with some crochet. I am beginning to think that she likes to poke holes in things too. Way to go Steph! 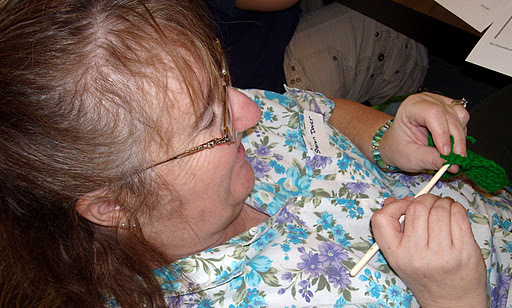 Sue has been poking holes in some rick rack and I told you that she would have this done for this meeting. 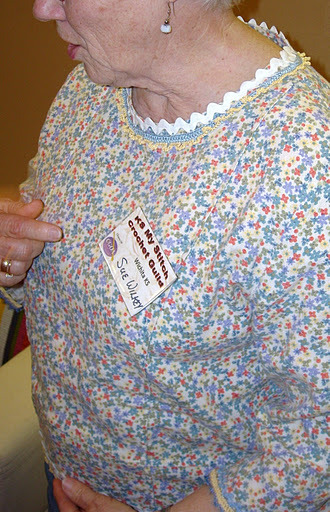 But this is great because she is wearing it too. And then there’s Jackie. 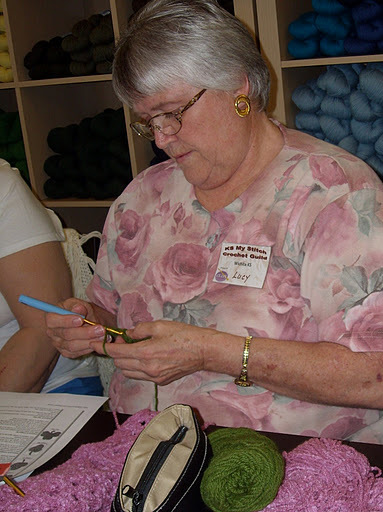 I wanted to make everyone think that she was crocheting, but she’s not wearing that thimble on her finger to crochet with. She’s actually embroidering. 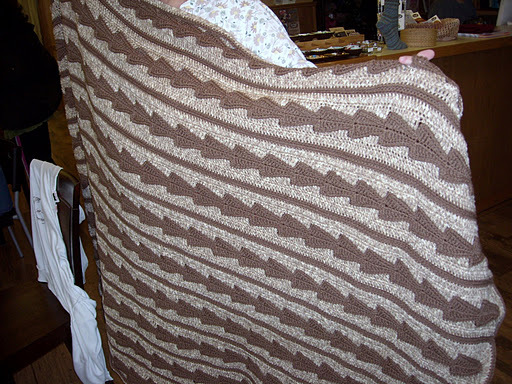 I think I will have to take that blanket and finish it for Baby Ava before the baby is a teenager. But look how pretty she looks and she’s my Sister and I love her anyway. 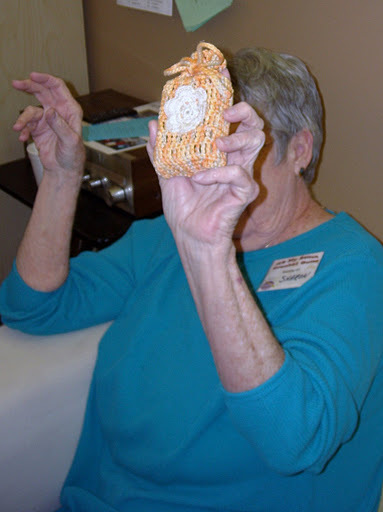 Kelly is crocheting a bag too. 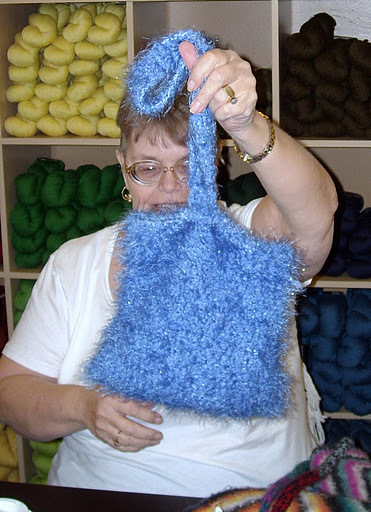 But she was in on the lesson about gauge so she learned before she started the bag. She will not be making the same mistake I did. Isn’t this the cutest little Lepraucan (sp?)? It is called a flat doll. 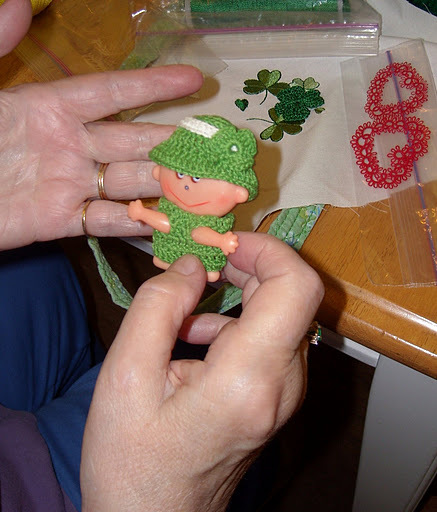 But he has a teeny tiny sweater, pants, and hat with a shamrock on it. Diane brought this cute little doll and she was one of our visitors. We were glad to have you Diane. 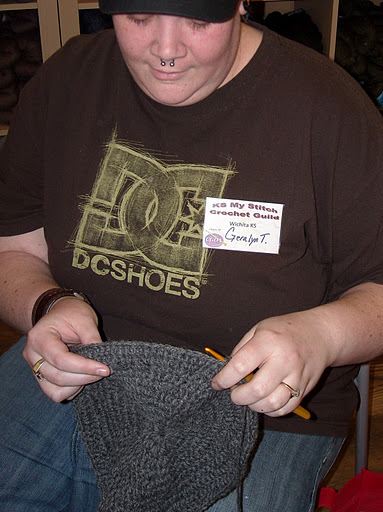 Geralyn is crocheting a hat. 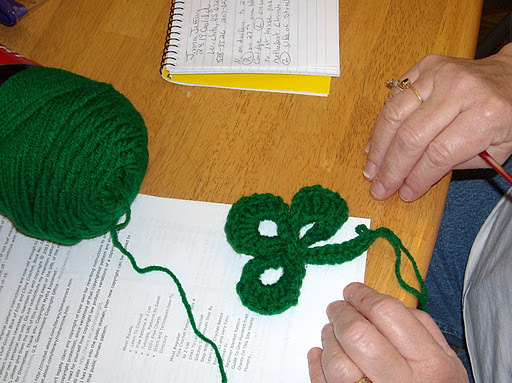 Wendy made a shamrock for the program. 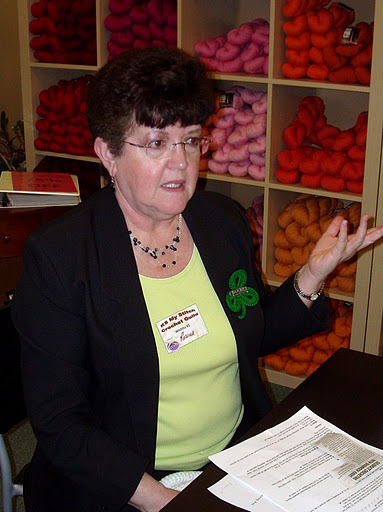 Rosina is wearing her pretty little crocheted shamrock pin. Very nice and irish. 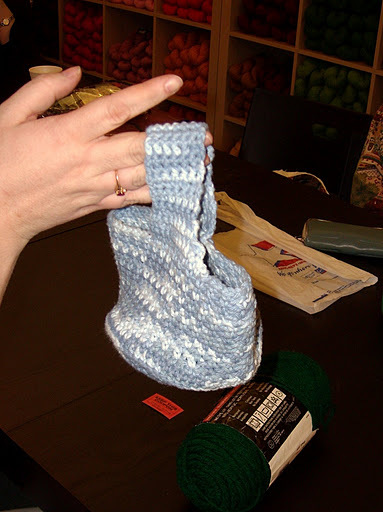 Lesa made a little crochet bag. 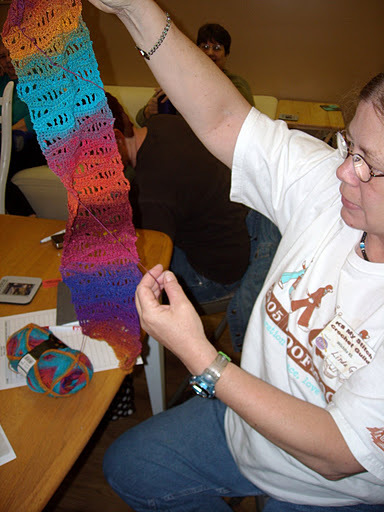 Cori finished another one of her scarves from her own design. 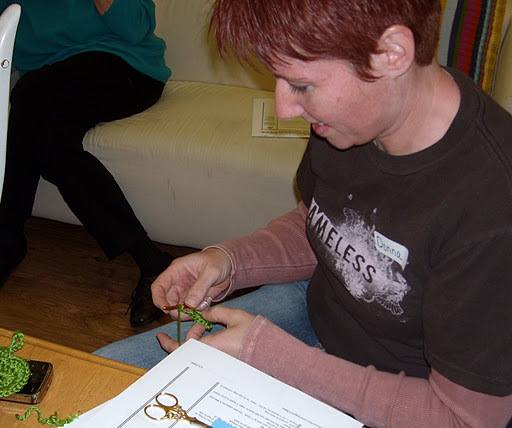 Then it was time for the program on making shamrocks. I think everyone had a great time. I know I did. 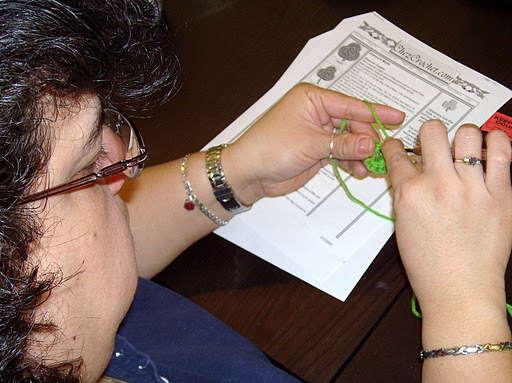 Here are some random pictures of all who joined in on the making of shamrocks. No. 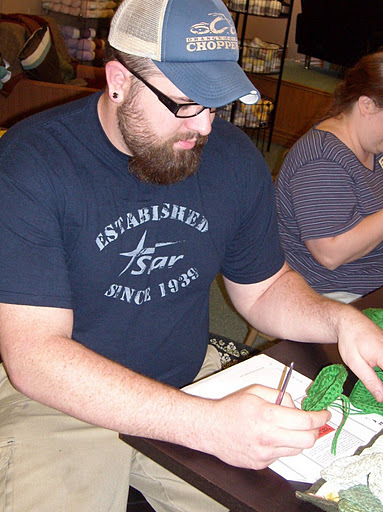 Wes was not actually crocheting. That is my shamrock. Wes is Geralyn’s fiance.